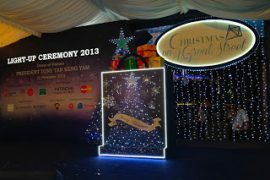 From Singapore, I took a direct flight to Cebu. The 3.5 hours flight then continued by another 3.5 hours journey by a rented car. 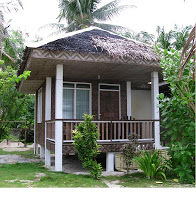 Cocobana Resort, where I stayed in Malapascua Island, had arranged a pick-up transportation for me for PHP 2,700/one way. It definitely made the trip easier, otherwise I had to struggle with the beauty of bargaining price with the Philippino taxi drivers! And please bear in mind, the cars used for taxis reminded me of the taxis in Jakarta back in the ’80s, old cars, with a lot of clinging noises as if it’s falling apart! 😀 So, I was definitely happy to see the type of car that took me to Maya harbour. At least I could sleep for another 3.5 hours in a nice air-conditioned car :). Fortunately, it was only that day in which the weather was murky. The rest of the days there was all sunny and warm. I chose to dive with Thresher Shark Divers center, because they were willing to dive in a small group. 1 Dive Master would take only up to 4 divers, which was good. I felt more comfortable diving in a smaller group. 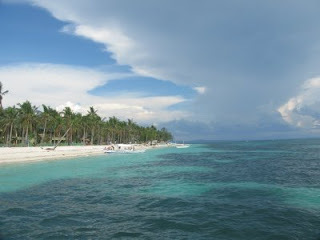 I had 11 dives in total, including 1 night dive, during my stay here. And for this trip, I deliberately bought a new camera and an underwater housing… with the hope of seeing the pellagic thresher sharks and share some of the joy of my diving experience with you… 🙂 And this will be my second experience of taking underwater pictures, after the Bali trip last August.. so, I do hope you guys enjoy the pix! The first dive was in North Point. The current was very strong and I got panic once I jumped off the boat. Couldn’t catch my breath… it was scary! It was definitely the strongest current I’ve ever experienced! I told the Dive Master and the crew that I was panicking. Then, they took me back to the boat. The dive master thought that I would abort the dive, but I wouldn’t. Just needed to catch some breath before jumping in to the water again. I only dove for 20 minutes coz there was a miscommunication with the dive master down there. In the middle of the dive, he told me to buddy-up with the dive master from the other group, but then when I swam to the other group, they were ready to ascend! What??? And I still had 100 bar in my tank! So, I ascended anyway… later on the boat, I asked the Dive Master what was it all about? He explained that he didn’t know the other group was about to ascend soon. Oh well… I think, next time he should’ve known better before he asked someone to change buddy/group, aight? We continued our dive sometime in the afternoon in Pantigi. 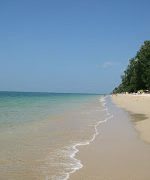 It was a muck dive, no current and shallow dive with the maximum depth of 15 meters. 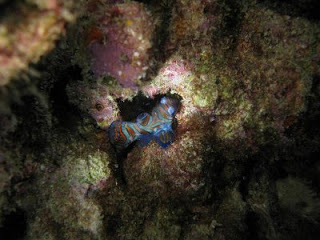 Pantigi was a good site for those who love underwater photography as there were a lot of tiny animals, such as porcelain crabs, nudibranchs, shrimps, snake eels, cleaning shrimps, etc. 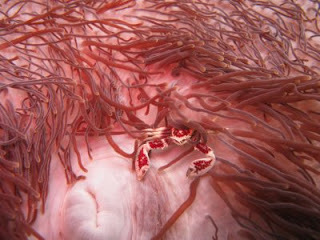 I also saw two seamoths walking together on the sand :). Loved their “wings”! 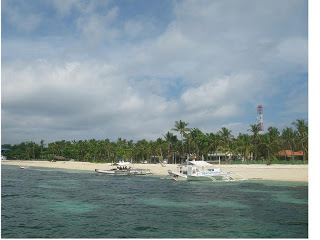 The most famous dive site in Malapascua Island is MONAD SHOAL. This is an underwater plateau where divers can see the pellagic thresher sharks and manta rays face-to-face. Thresher sharks can be seen in the morning, around 5am – 7am, while manta rays can be seen in the afternoon, usually around 2pm-4pm. On the first morning dive, we left at 6.30am from the island. It took about 30 minutes by boat to get to Monad Shoal site. There are two points, named “Shark Point” and “Manta Point”. These points are the cleaning stations for these two big creatures of the underwater life. 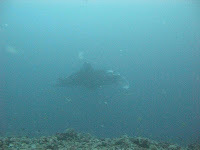 Usually the divers wait there at the depth of 21.3 meters until either thresher shark or manta ray appear. 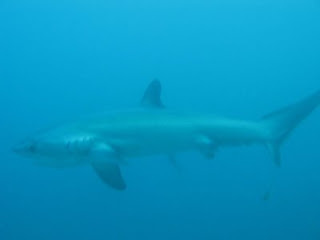 I saw one thresher shark passing by in a 10 meters distance. Too bad the visibility wasn’t too good and the shark didn’t stay long there. So, I only saw it briefly. In the afternoon, I was planning to indulge myself and try the local spa. Have already took a glimpse of the massage package at Exotic, they have: Swedish Massage, mixed of Swedish and Shiatsu and Aroma-Therapy massage. The prices around PHP 600 for 1 hour!! It’s really cheap compared to the massage in Singapore! 😀 But before I rushed to the spa place, I checked the dive schedule at the Thresher Shark Divers center and this was written on the board: “Next Dive: Monad Shoal – manta ray”. Waaaa…. I definitely wouldn’t miss it for the world! A massage can wait and it can be found else where in Singapore and Jakarta… but a manta ray? We jumped in to the sea at 3pm and went down to 21.3 meters depth… there were some other divers waiting at the same spot… some of them with big cameras and sophisticated strobes. One diver next to me even had two long and big strobes.. so long it even looked like an elephant’s trunk! After 10 minutes… finally the manta ray made an appearance! Wooohoooo… A 5 meters of manta ray swimming elegantly in front of a number of divers…. back and forth… just like a model walking on a catwalk! The divers with cameras were all busy taking pictures and videos… including me… hehehe… It was such an amazing feeling to see a big manta ray with my own eyes.. 🙂 Loveeee it!!! And the luck didn’t stop there. 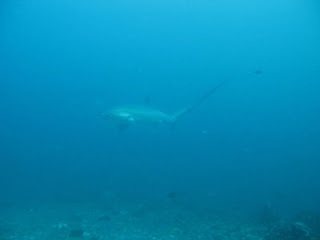 The second morning dive, we left for Monad Shoal at 5.30am and saw 1 thresher shark at the Shark Point. Then we moved to the Manta Point… and… after waiting for 5 minutes…. there was 1 thresher shark coming and swimming towards my direction!!! Whoaaaaaaaaaa… it came closer and closer… my heart beats faster.. I thought, “Omigod… what am I gonna do?? If the shark attacked me, shall I swim fast or shall I stay still pretending to be a rock?” I tried to make as little bubbles as I could. The shark came really close, about 4 meters away! Then it turned to another direction… fffiuuuhhh.. but… it came back again! 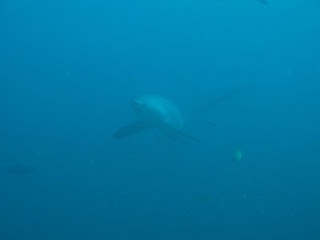 Waaaa.. and… guess what… there were 2 other thresher sharks coming!! Whoaaaaa…. three of them swimming and circling in front of us for more than 20 minutes!!! OH MY GOD!!! Wonderfuuuuullllll… our sights were locked to those three sharks. It was such a stunning view to see those pellagic thresher sharks with their weird shape-long tails swimming in circle, just like dancing in a group of three… sooooo cool! One could imagine how happy we were after that dive. We were jumping around on the boat and share the excitement of how great the dive was. I recorded a video of those three sharks in my camera. Very nice. 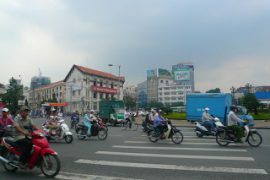 And here are some shots that I took (without photoshop) :). Wish to see one of these sharks??? 😉 Go scuba-dive in Malapascua Island!! You won’t regret it!! !